Initial analysis of the seabird counts show no major increases or decreases of the cliff nesting seabirds. More analysis is still to be donebut as further information becomes available we shall keep you posted. The whole island Manx Shearwater census is now complete and is with the super-computer (Prof. Chris Perrins) for further analysis. The general feeling is that the Manxies population is doing very well. The Royal Commission has been getting some insight into prehistoric ways of life and survival on an off-shore island from the expert – Ray Mears. 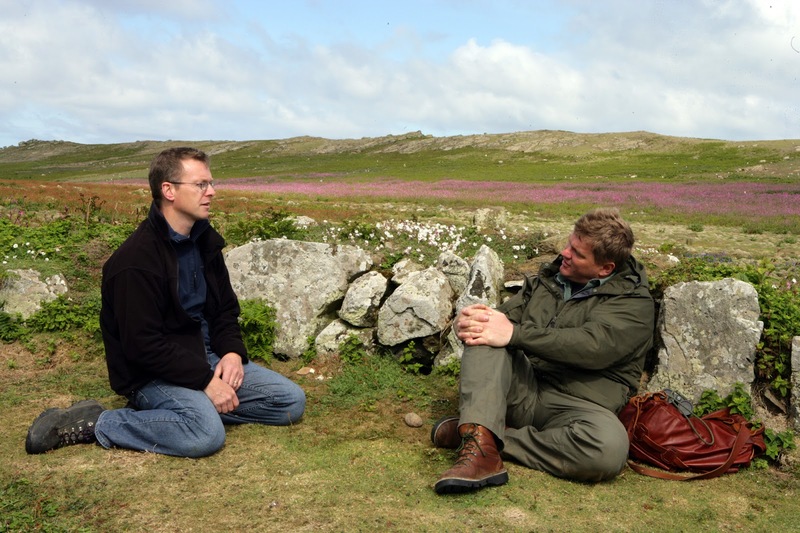 As part of the Skomer Island project, where the Royal Commission is working with partners to map and understand the well-preserved prehistoric houses and fields, we were invited to film with Ray Mears for his new television series Wild Britain, due to be aired on ITV in autumn 2011. Filming inside one of the best preserved Iron Age huts on the south of the island, which is still accessible to visitors, Ray was fascinated to hear how a combination of aerial photography, airborne laser scanning and detailed ground survey is allowing the Royal Commission to develop a new understanding of the ways that Skomer was settled and farmed in later prehistory. However, Ray’s international knowledge of the ways that modern tribes and peoples live off the land brought new insight some aspects of Skomer’s prehistory. Ray reminded Toby Driver that Burdock root was a common cultivated vegetable before potatoes came to the British Isles, and an important part of prehistoric diets; it still grows on the island today and may once have formed a staple crop. He also discussed the need for managed woodland on the island in prehistory, which would have provided not only a renewable source of straight poles for building and fencing, but also hazel nuts in the autumn which were a valuable source of prehistoric protein. Current blank areas in the prehistoric fields may show where permanent managed woodland was located. Ray was particularly taken with some recent finds of stone tools from Skomer, collected from the ground surface during survey work this spring. Properly recorded prehistoric finds from Skomer are lacking, so these rare finds will be carefully studied and catalogued before being placed in a museum. 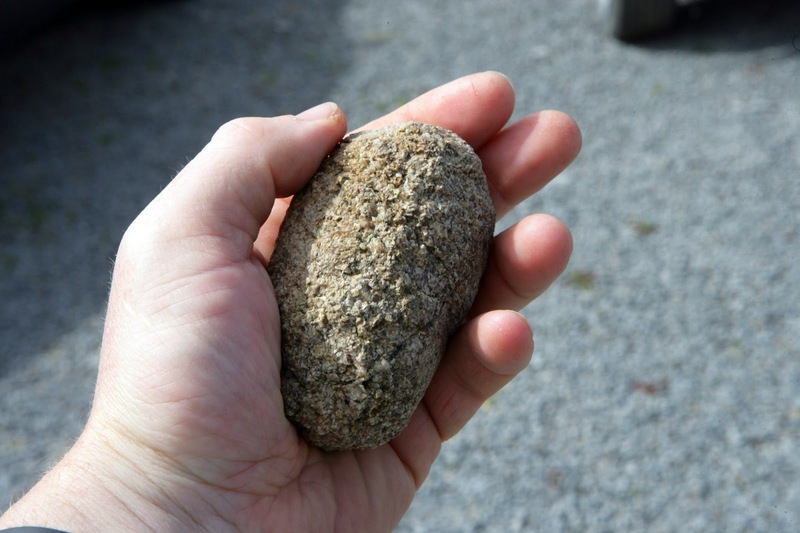 Ray liked a hand-sized rubbing stone, collected from the prehistoric fields on the northern part of the island and doubtless used with a quern stone to grind corn to make flour. He noted that Aboriginal examples of rubbing stones can be passed down many generations as a family tool. He also like a small flint ‘burin’, manufactured from a flint beach pebble, which is a pointed tool held between thumb and forefinger. It was found along with other flints on an eroding headland on the north-west of the island. Some burins may have been used to pierce holes in leather, but Ray thought that this one was just the right shape to cut needles from animal shin bones; the Inuit people of the Arctic still use similar tools today. Work continues by the Royal Commission during 2011/12 to make a new map of Skomer Island’s prehistoric fields, working from specially-flown airborne laser scanning data or LIDAR from the Environment Agency. Find out more about Skomer Island in prehistory at www.coflein.gov.uk . ‘Quicksearch’ for Skomer. Springwatch all began back in Januar with a meeting between myself and a producer and a cameraman - Ian llewellan. The original aim was for a Short-Eared Owl Diary. This developed into Iolo coming live from the island for one night, which then developed to live every night - not something you would normally agree to in the first week of June - the busiest time of year on Skomer both for wildlife monitoring and people. Thanks to all the efforts of the volunteers, assistant warden(sarah) and Sue (VSO) - without which this would never have been able to have been pulled off. With there help they have kept me sane from the Springwatch invasion and have kept the island running. Using an adapted second hand CCTV camera (sounds like a high budget production but it worked) Ian captured Manxies performing adult behaviour on the surface - something which we do not think has been recorded before. Steve was my second housemate who came in to film the second half of the footage, including chicks from Short-eared owls. Gary Moore - wildlife soundman got his parabollic reflector out......amazing piece of kit which made you feel right in the centre of the sound. Dread to think how much it cost. When it came to live week, people needed organising. In order to maintain sanity of the warden the garage was converted into the storage area. The lime kiln shelter was converted into the communications shed. The library was converted into a general meeting room - here is Iolo learning his script. Holly, Tim and Iolo preparing to download a geolocator. It has been a great week and thanks to all involved. 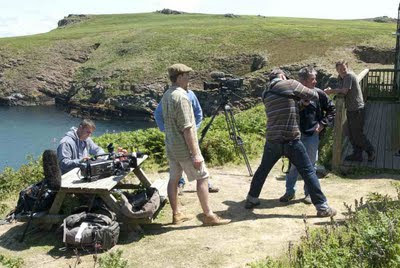 I hope it has shown all sides of Skomer to audiences that may never have experienced such a place. Springwatch arriving and rabbit for breakfast?! Lots going on at the moment with ITV Wild Britain being filmed last week and Springwatch to be going out next week. I sit here awaiting a boatload of "live" kit - all of which will have to carried up the steps as it is too windy to launch the Island boat. Whilst all this goes on the whole island counts (Fulmar, RAzorbill, guillemot and Kittiwake) are going ahead -early indications show another bumper year of guillemots. We are also carrying out a whole island census of the Manx Shearwaters - there are 303 study plots of 10m diameter which will be checked for occupancy by playing the call of a shearwater down the burrow and seeing what responses you get. This survey has not been done for a 10 years and will be very useful to repeat to understand the health of the Manx Shearwater population. Below is a letter received from a chap who stayed on the island in 1946........not sure if I fancy rabbit for breakfast though. In the first few months of the West Wales Field Society receiving visitors things were far less organized than today. On arrival at Haverfordwest station at 10 am I had expected to be met but no one turned up. However the instructions included a plan with the information that a boat would leave Martins Haven at 3 pm. To avoid the tedium of waiting I set off on foot with my luggage, got as far as possible on a bus, thumbed a lift to somewhere nearer and walked from there. Eventually the boat arrived at the same time as the rest of the party, escorted by R. M Lockley, who gave me a firm handshake. The boat was small and the sea smooth. The warden had rabbit snares, one of which I borrowed and set within sight of the house on the first evening. There was a rabbit in it next morning, which was I skinned and prepared for breakfast. The rest were too wise to be caught. In the evening we were given a lesson on ringing birds. After that we were left to our own devices. There were no paths and I do not remember any prohibitions. Our only equipment was a bamboo rod with a wire hook on the end and pliers for attaching a numbered ring. Catching puffins was quite easy. In the evening what we caught was logged. The warden and his wife were very helpful. We were split into teams of two to cook meals from the food they provided. Halfway through the week we were taken to Grassholm in a launch chartered by a group of archaeologists, who went there to dig up the well. The sight of close packed nests with sitting birds was a fantastic experience for us. They were far too fierce to get close and the combination of rotting seaweed and gannet droppings left an indelible impression. There was something hush hush about the occasion and when I later enquired about the name of the leader of the expedition there was no record of it in the Skomer log. Perhaps something to do with the fuel, which was, of course, still rationed then. On the homeward journey I chatted with one of the undergraduates in the party of archaeologists. He had pockets bulging with shards of pottery. I still remember the occasion because when I asked if the dig had been successful he replied no, the pottery was too early. The shards were of two kinds, some delicate, one of them decorated with a wart-like protrusion, in what was then called Samian ware, which I knew to be Roman, and a greyish brown kind, thicker and quite smooth, which I was told was more interesting. There is no record of the dig. If there had been it would have been mentioned in the current literature. I reported it to the appropriate Welsh archive but no interest was shown. What was being looked for remained a puzzle until I came upon the story of the god Bran, whose severed head is said to have entertained his companions for eighty years on the Island of Gwales, thought by some to have been Grassholm (Penguin Mabinogion Gantz 1979, footnote to p.80). At that time any thing vaguely Arthurian was considered post-Roman. Another possibility is Preiddeu Annfn, an expedition by Arthur to an island from which, like that to Gwales, seven men returned. That could explain digging the well but not the fine pottery. However, imported late-Roman pottery in Ireland and Western Britain is now well known (see Charles Thomas, archaeologist, among others), for instance at Tintagel; and the thicker kind could have come from an amphora. The archaeologists who failed to report the dig missed a scoop and have damaged the site. The next day we went in the launch to an inaccessible bay stacked high with of timber from a torpedoed merchant ship and collected a load to stock up the farm. The weather was fine all the week. We saw the raft of shearwaters in the evenings and they came in on the last evening.